Has anybody had a problem with the new upgrade? Just wanted to make sure before upgrading as last time there was an issue. I couldn't take any 360 photos after the update yesterday. Super fun. 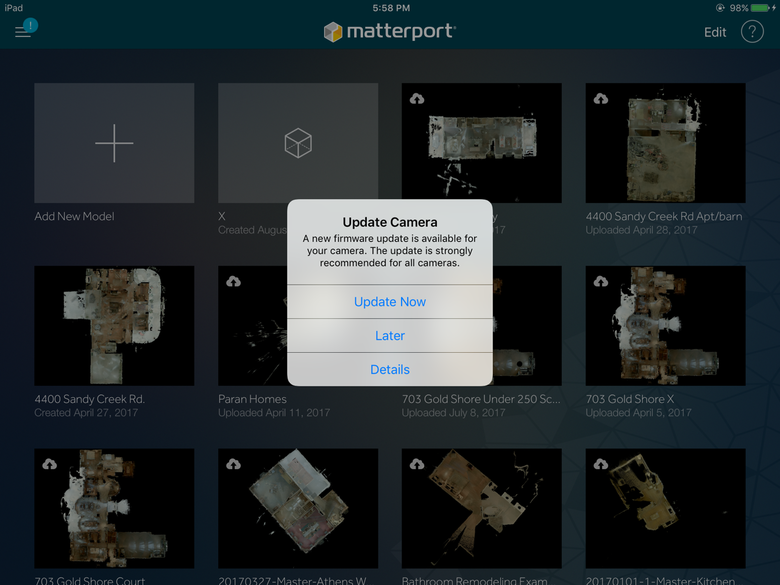 If you have updated to the latest Matterport Firmware and Capture App (Version 2.3.3) update, as described in the Matterport eNewsletter Thursday (10 August 2017), please post if you are / are not having problems. I didn't see anything that said this was a camera update, do we need to connect the app to the camera on this one? I have updated Capture app, but no news on the firmware update. My application didn´t mention the existence of a new firmware update so far. 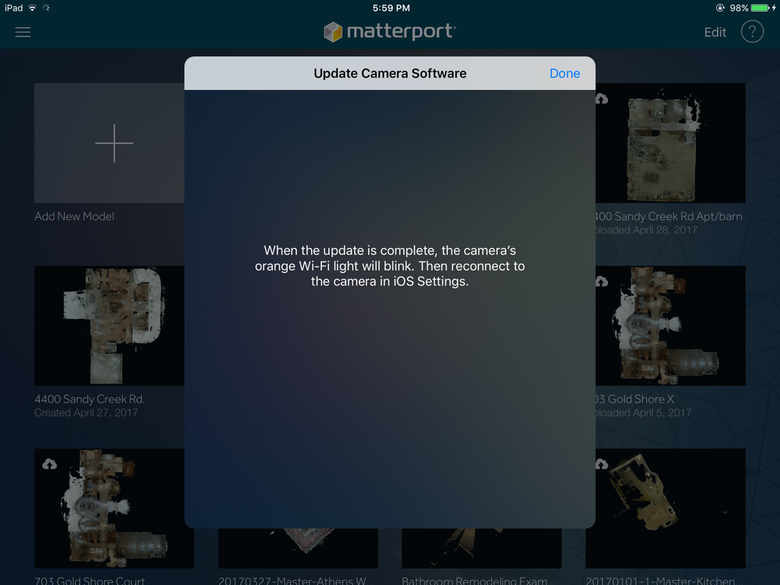 Trying to decide if we should update the Matterport Camera firmware, iOS and app Saturday (12 August 2017). If I am not able to shoot 360 Photos with the updates, that concerns me. Anyone do all the updates and are happy? Do you mean that you lost the ability of taking 360s after updating firmware? I have updated app but have not seen anything about firmware update. I don't know how to do that. I would like if your input spoke specific to the older camera and new camera, because this might determine if some one sees a download or not. The download maybe camera specific and may worry someone that they are not firmware current when there is no update for the specific camera. So the conversation could go two ways. Thank you in advance. I was expecting to do a firmware upgrade today (Sunday, 13 August 2017), but I am not getting a notice that a new firmware is available to me. Any thoughts about whether my firmware is current? So, yes, there was a firmware upgrade for me, BUT, it took a few steps to figure it out. 2. then shut down both devices and restart. 5. Now, shut down both devices and connect the Capture app to the internet. I could imagine what is happening is that the Capture app asks the Camera, "What version of Firmware are you using? Then, when the Capture app gets connected to the internet, in the background it is asking Matterport, "What is the latest version of Firmware for this Camera?" Hmmmm. It's new. Let me download it (may take a while). Then when the Capture app is connected the Camera again, it says to the Camera, "Hey, I have a new Version of Firmware for you. Let me see if the user is ready to update. Hold on a sec while I ask?" "Dan, would you like to update the Camera Firmware? This may take five minutes, or so." "Okay. When the Firmware is updated, I will let you know by blinking the Wi-Fi." The point is, I wanted this to happen at home: not while I am scanning this week. 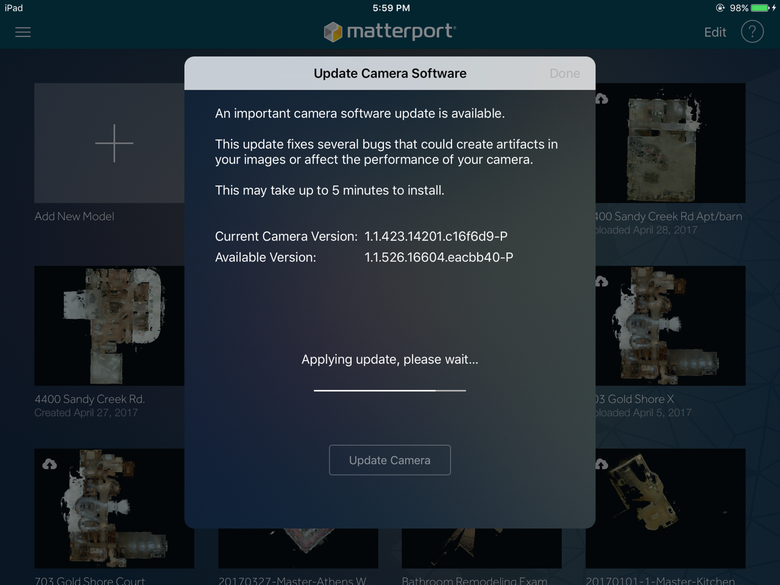 Since Matterport does stuff in the background without telling you, if you have not updated the Camera Firmware - and want to - do the above at home when you got an hour. Otherwise, you are going to show up for a scan and be disappointed when you get a message that says there is a new Firmware update while scanning is not your first choice. I hope this helps you (all). I too have a first generation camera. I updated app and camera but I'm still on an old version of iOS (the one just before "it was a major upgrade" we were warned to stay away from). I assume it's ok now, I just haven't done it. Anyway, after the app upgrade, it said it "repaired" 64 of my scans but what it basically did is wipe them out. I have 64 place holders for where my scans used to be but when you open them, there are no scans inside. The names are there, when they were created is there but the thumbnail is gone and like I said, no scans inside. I did do 2 shoots today and they processed fine. Seems a little faster to me but that may be wishful thinking. It also stopped making sound for me when the scan is done. iPad is not muted and sounds are turned on in the app settings. I must be like Pavlov's dog as I guess I rely on that sound a quite a bit. Kind of annoying but I got over it. You should see a little spinning wheel in the top left when the Matterport Capture app connects to matterport.com to check for updates / check your account. I wonder if - if the above is true - that the Camera requires less power than it use to. Any news on issues as I have a shooting tomorrow. For me the most important question is what effect does it have on the virtual tour results and capturing in general. Any official post from Matterport on this? I updated and didn't have any issues with scans I did on Wed. I updated and it actually fixed my mixed up Models from the update a few months ago! Did my first scan with the update yesterday, everything looks great. I have also updated about 2 weeks prior and happy with the scan app and iOS update. It has also fixed my mixed up models. One thing that came to my attention: you can now capture a 360 view without having a 3D scan. That is good to hear, I had not tried. Thanks for the post. Perhaps this is related to the Google Street view feature of Matterport? Shot done & all is o.k.